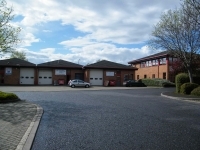 Unit 6 Berks Business Centre has unexpectedly come back to the market and is now re available on a 999 year lease at a peppercorn rent. The unit which is 2171 sq ft has loading facilities 7 car spaces and clear warehouse span. Quoting orice is £190,000 plus VAT.